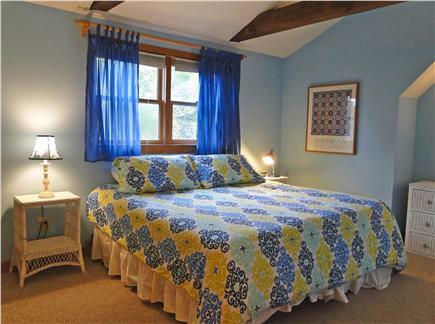 This bright, cheerful, easy-upkeep home is available year round for a relaxing extended stay or a weekend get-away. It is immaculate, well cared for, nicely furnished, and well equipped. Kitchen was recently renovated. Mini-split AC units in all rooms. 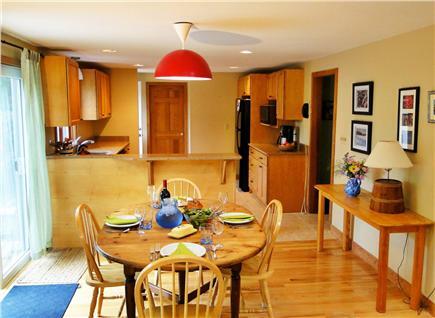 The open concept makes it easy to cook and socialize. 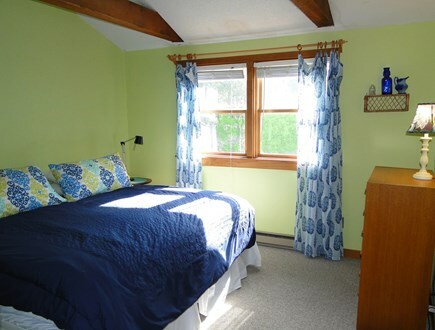 The home works well for two small families, with a spacious master bedroom (king-sized linens provided) and full bath on the first floor and two bedrooms with a loft area and a second full bath upstairs. The private yard on a quiet lane makes it a terrific location for young children. 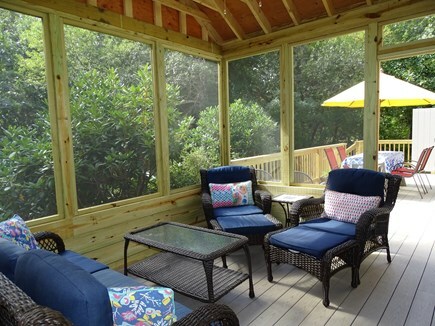 A new screened porch and deck are great additions. 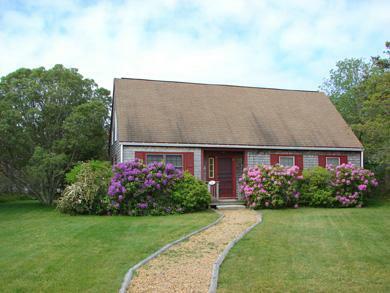 It is 1/4 mile from the State Forest bike path and convenient to town, shopping, and all Island beaches. Additional pricing info: off-season arrival dates negotiable, State and local taxes of 5.7% will apply. Owners were very easy to work with. Property seemed very private, plenty of room for our group. 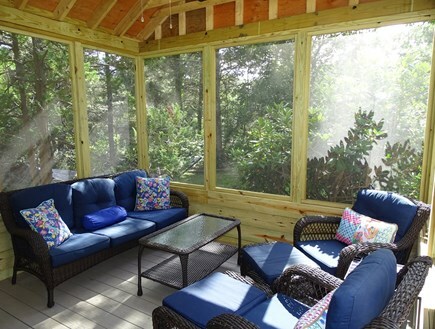 Love the new screened porch and deck. Great outdoor shower. Well equipped. Beds were all comfortable and rooms had a lovely breeze even on hot days. Can't wait to book for next year. Thanks. So glad you enjoyed our home. You were great guests. Happy to have you back next year. We love the new deck and screened porch too. Noticed you gave a 4 for cleanliness. What could have made it a 5? We loved this home! 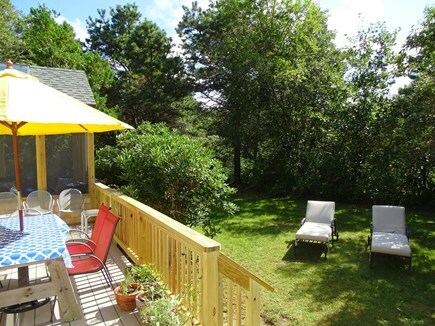 Beautiful private wooded location, A/C, fab screened porch, large deck & yard, outdoor shower, comfortable beds, great kitchen, good WiFi, near shopping, ferry, beaches - quintessential MV! So glad your group enjoyed our home. Thanks for sharing this. Hope you come back. Thanks, Mary Ann. You and your group were great guests. So glad you enjoyed your stay. Your kind words are much appreciated. Hope you come back again. We loved our time in this house! This house is comfortable, clean, attractive, quiet, and the location couldn't be more convenient. The private deck is a great spot for breakfast or dinner. Kathy is terrific; she answered our questions promptly and fully, and is most generous about sharing her Vineyard knowledge. We hope we can return to this lovely house! Thanks, Carin. So glad you enjoyed our house. Happy to have you back any time. Looking forward to talking with you again. We loved this house! There was plenty of room and had everything we needed for a comfortable stay. Kathy was a gracious host and went above and beyond to make our stay special. 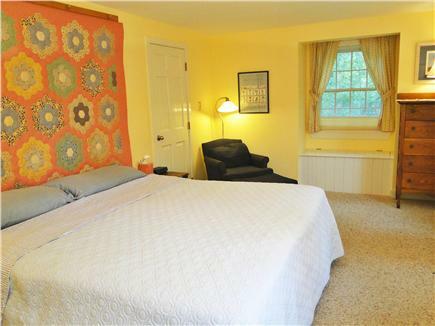 The house is charming, well maintained and roomy with A/C and Wi-Fi. It was a perfect getaway that was close to everything. Thanks, Mary Ann, for your kind words. So glad you enjoyed your stay. It was a pleasure to have you inour home. Hope we talk again. This is a wonderful space to vacation and get away from it all. 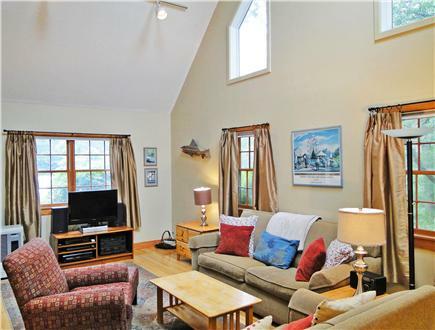 This house is spacious and well kept, and the owners are very accommodating. There is a beautiful walking path just up the road. Horses and roosters in the area nestled in a woods give it a country like feeling. The house is perfectly located for beach, shopping, and nightlife. Thanks for the great review. I'm so happy you enjoyed your time in our home. I always say we seem to get the bet tenants. Glad to have you in that group now too. Hope we talk again next year. Enjoy the rest of your summer. The house is very attractive, cozy, well laid out. 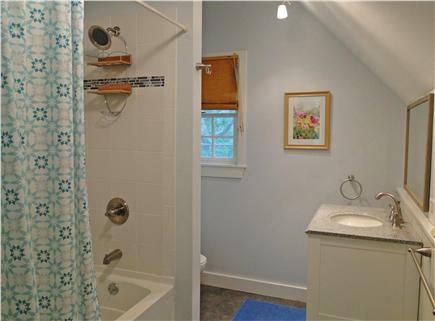 It was in a quiet neighborhood, but not far from major attractions. Actually, I loved the location because it was out of the "crazy" traffic and allowed for relaxation. House is well equipped and nicely decorated. Owners were very accommodating, good to work with. Will definitely rent from them again. Thanks so much. We are very happy you enjoyed your stay and hope you'll be back again next year. Thanks, Courtney. You were the best! Glad we could work around the ferry schedule so you could introduce your husband to the Vineyard. We couldn't have asked for better tenants. I appreciate your flower watering and attention to our old junker car. Looking forward to talking to you again soon. This is a clean, well equipped house in a quiet, residential neighborhood. The house is very cozy, yet had plenty of room for our family of four. The upstairs area is great for kids! 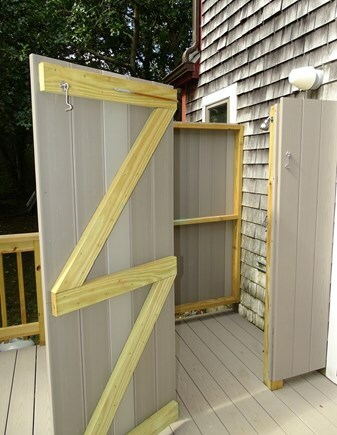 West Tisbury is a peaceful area with quaint stores and wonderful farm stands, away from the crowds and traffic. The owners are very friendly and helpful. They are easy to get in touch with and will answer all of your questions. We are so glad we found this house. We can't wait to go back! took great care of our house and I really appreciate that. Looking forward to talking to you again. Thanks again. 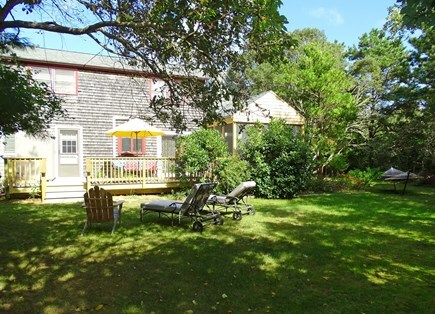 We have rented this beautiful house in West Tisbury for four years during Fair week. There is an updated kitchen that is well stocked and a brand new bathroom upstairs. The open floor plan allows us to cook and hang out together which is one of my favorite things to do. 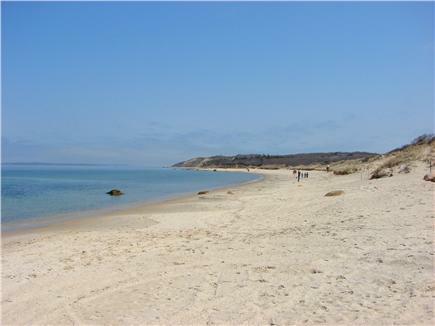 The location is amazing and gives you access to the most beautiful beach on the Vineyard, Lambert's Cove. The owners are wonderful and very easy to deal with. I highly recommend this rental. Thanks so much, Jen. I've enjoyed having you and your family in the house. Have a great fall and hope we talk again.